Andreas Maercker, one of the world-leading experts in psychological trauma consequences and post-traumatic stress disorder, is Professor and Chair at the Department of Psychology at the University of Zurich in Switzerland. He directed several basic and treatment research programs on traumatized populations in Germany and Switzerland. His research and clinical practice covers trauma survivors from different periods of life, traumatic experience of man-made or disaster origins, and from different countries or continents. From 2011 to 2018 he has chaired the working group “Stress-associated disorders” for ICD-11 revision by World Health Organization. The editors of the online journal Geschichte der Gegenwart (translates as “History of Present”) Svenja Golterman and Gesine Krüger, both professors of history, in conversation with the psychotherapist and psychiatrist Andreas Maercker. Svenja Goltermann: Andreas you are a psychotherapist and psychiatrist who has been working therapeutically and within research for many years now, especially in the field of posttraumatic stress disorder (PTSD). You have examined the psychological consequences of the experiences of political prisoners of the German Democratic Republic, war veterans of WW2, and Swiss indentured child laborers, amongst others. The term “trauma” is used frequently in the media, whether it is related to war, accidents, sexual abuse, divorce, or political defeat. What do you think about this wide use and how does it relate to your research? Andreas Maercker: The boom in using the term is not related to the disciplines that deal scientifically with trauma, i.e., psychology and psychiatry, but the influences of culture and the media. Professionally we have a much tighter definition of what trauma is. We talk about trauma when a person experiences an event that is life-threatening, where a person fears for their life, or where there is sexual violence. These unfathomable experiences affect people extremely or humiliate them to a considerable degree so that they can cause emotional and mental harm. S.G.: You say that everyday use of the term trauma has developed separately from its scientific usage, but in Europe the term became popular relatively late in the 20th century. To be precise, this was after the diagnosis posttraumatic stress disorder was included in the official classification system of the American Psychiatric Association in 1980. Which is why I ask myself if there is a connection. Have we seen an increase in the diagnosis of PTSD in the last 35 years? S.G.: Acceptance is the keyword here. Long-term mental health problems were much more stigmatized until well into the 20th century. And that has changed dramatically in the last decades, especially in relation to trauma. The MD and social anthropologist Didier Fassin and the psychiatrist Richard Rechtman have developed an interesting idea in connection to this. They argue that PTSD is categorically something new because the diagnosis assumes that an external event is the cause for the long-term or late-onset mental and emotional impairment. This wasn’t the case with earlier concepts such as neurosis, where it was assumed that disposition or personality played a role. Does this then have a de-stigmatizing effect? A.M.: That’s an interesting point you make. It really is about a paradigm change when we recognize something external as the cause of a mental disorder and through that then de-stigmatize those who are affected. Psychiatry has always taken into account event-dependent, reactive changes, but in doing that we only consider the short-term mental changes. However, the paradigm shift is related to the new cognitive memory theories of Chris Brewin and others, which say that an external event can cause a sustained memory disturbance for which there must not be a predisposition for. This plausible conclusion has unfortunately been so simplified in various circles, including psychiatry, that essentially only the event and its magnitude are viewed as determining what happens mentally. That’s why we see expert psychiatric reports that focus on the seriousness of the events and do not investigate what is going on emotionally or mentally. S.G.: The concept of PTSD has changed again since 1980. The initial idea that extraordinarily stressful events cause a trauma in most people certainly has not been maintained. Already in the 1990s, psychiatrists and psychologists were much more careful. They didn’t assume that an event such as war or sexual abuse would automatically lead to emotional and mental damage. Do you also believe that is the case? A.M.: I would even say that the idea that the seriousness of the event is more important was always a matter of simplification. Around that period, there was another group of scientists, the psychodynamic-oriented Mardi Horowitz, among others, who were very interested in investigating the symptom patterns of those affected, such as the different sensory qualities of the flashbacks, the continued heightened alertness, or the persistent feelings of shame and guilt. S.G.: If we look at the field of humanitarian aid in the late 1990s and the projects that were developed within the United Nations (UN) to help war and crisis areas, we find many descriptions of PTSD and its distribution. There are statistics that state that 70% of the people living in the Balkans during the war were traumatized. There are war zones in Africa where the percent affected is even higher, up to 95% in some countries. How are such figures calculated? Are they based on the events and that posttraumatic consequences are related to how atrocious they were? Or are these statistics based on studies? You have said that research is based on a much stricter definition of trauma. Is that the case here too? S.G.: In other words, politics plays a role here? A.M.: Yes, politics, publicity and the mechanisms of the media. For a long time in the US it was much debated how many veterans of the Iraq war had PTSD. There were very high estimates that the media and stakeholders picked up on, and then there was a correction to these statistics that reduced the figures which hardly anyone noticed. Gesine Krüger: When we take a stricter definition of what trauma is, above all that a threat to life and sexual violence is the trigger for PTSD, then this is not based on objective data but is a question of perception, is it not? What threatens my life, what is sexual violence for me? How can we take into account in research and, of course, in therapy, that what we are dealing with here are perceptions that have developed very differently historically and culturally? A.M.: It is becoming clearer and clearer to us, which scientific historians have long stated, that we can only speak of PTSD when we perceive ourselves as individuals, as autonomous and separate from others. This also includes language itself and how a culture expresses feelings and sensations. We are currently carrying out two ethnological studies with indigenous populations who talk about trauma constellations, by which they are actually talking about historical trauma and collective experiences. They talk about the injustice that was inflicted on their ancestors and themselves. G.K.: But is that not related to the research setting? In that when a stranger comes in an official capacity then this of course arouses exactly this talk of historical injustice and its reparation, which has now become a global currency. A.M.: Yes, we have tried to be as sensitive as possible in these studies, e.g., those in Pitaguary in North Brasil. Here a colleague who looks Brazilian-African collected the data. A.M.: … all the same, when we ask what the really big issues are that people face, then these things come up: What was taken from us? And: So and so didn’t come back after they were imprisoned. This shows that it is often about the shared experiences. Of course, we also use the results from other studies. And, yes, sexual violence is probably present in many cultures, but it is often associated with taboos, as well as occurring in many different forms, but looking at it from outside the culture we don’t hear about it so much. A.M.: Yes, with ethnologists who have had contact with these indigenous people for a long time and also with linguists from these countries, because we are interested in the words and metaphors used for trauma and wounds. S.G.: Criticism has been raised about the concept of PTSD, that it is a Western concept with very specific ideas of the individual and the psyche that can not necessarily be transferred to all parts of the world, because it isn’t always applicable. To ignore this, is practically a culturally imperialistic act, because only a very specific schema of questions and interpretations can be used. On the one hand, we can’t totally dismiss this, but at the same time this criticism is not completely unproblematic, because – if we are blunt about it – it could lead to the conclusion that people differ in their susceptibility to trauma. Are there so-called uncontacted cultures that react completely differently to acts of violence? A.M.: Absolutely! That said, this topic is extremely complicated and as a result also very interesting, especially because there are no clear answers at the moment. We really must get away from the dichotomy of universalism and relativism regarding the trauma reaction as both sides of the coin are too problematic. The solution lies somewhere in the middle because trauma consequences in other regions of the world have different constellations to those we have in the Western world. In other cultures, the body plays a much bigger role, where in addition to memory the integration of awareness with all its symptoms is also important, in particular, dissociative symptoms such as movement and sensory disturbances. On the other hand, I am convinced that in other regions of the world the nonverbalization and nonreflection of serious trauma consequences can lead to suicide or early death. G.K.: When you say that a universal or relativistic approach is problematic, then in both cases there comes in addition the aspect of translation. When we talk about individual and cultural notions of soma, psyche, soul etc., then this is already a translation into which our own ideas flow. Maybe a way out of this dilemma – either we’re all the same or everything is relative – lies in the practice. What I mean by that is when we apply the knowledge we have gained from a different culture to our own culture, we suddenly notice that what originally felt foreign is simply something we hadn’t noticed in our own society. And vice versa. For example, I read an article about a center for traumatized African women that they come from a completely “different culture” and they shower for hours after being raped. But that has nothing to do with Africa. Can not the knowledge gained from this aporia, arising from the tension between universalism and relativism or particularism be beneficial for building theories and practice in one’s own culture? A.M.: Exactly, that is the current position of our work. I can give you an example: We have found in other cultures we have just been researching that trauma always develops or decreases in connection with other people. For us that is a lost perspective. Yet, nobody can survive the beginning symptoms of PTSD on their own; others are always needed. And when somebody doesn’t have these people, for example, when they are imprisoned, then they have to imagine these others. In this regard, research in Brazil and India shows something that was barely known in Western culture and that can now be seen as being evident, namely, the most important so-called persisting factor in PTSD is the degree of social support. This article is based on an online interview published in Geschichte der Gegenwart: Artikel URL: https://geschichtedergegenwart.ch/trauma-und-kultur-ein-gespraech-mit-dem-psychologen-und-psychiater-andreas-maercker. 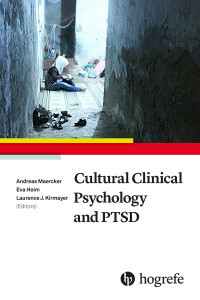 This book by leading international experts looks critically at how culture impacts on the way posttraumatic stress and related disorders are diagnosed and treated within clinical psychology and psychiatry.